Attention, powder enthusiasts! Cat Ski Mount Bailey, one of North America's oldest cat skiing operations, offers an unbeatable amenity: a full day of fresh tracks. With just one snow cat accessing 6,000 acres of deep, fluffy Oregon powder and more than 20,000 vertical feet, you are guaranteed an unforgettable experience. Just minutes from Crater Lake National Park, Cat Skiing at Mt Bailey is the premier back country skiing destination of Oregon. Mt. Bailey, at 8,363 feet, is a dormant shield volcano located in the Cascade Range in southern Oregon. A veritable natural terrain park, the mountain also features ski-able chutes, bowls, and quiet glades of Mountain Hemlock from December through May. The area, which includes Crater Lake National Park and Umpqua National Forest, accumulates a whopping amount of snowfall each winter, approximately 600 inches annually. Though consistent snowfall creates a naturally-occurring stability within the snow pack, Cat Ski Mt. Bailey sustains an impressive avalanche-control protocol to ensure your safety. Once the mountain is declared skier-ready, everyone piles into the trusty snow cat for the first of many 20-minute trips to 8,000 feet. Professional guides accompany each descent, both for safety reasons and to make sure you experience all that Mt. Bailey has to offer. You experience the same blissful day of backcountry powder at a fraction of the cost of helicopter skiing. Snow cats are also far more durable than helicopters, and are able to travel in most weather conditions. In the event that weather prevents the ascent up Mt. 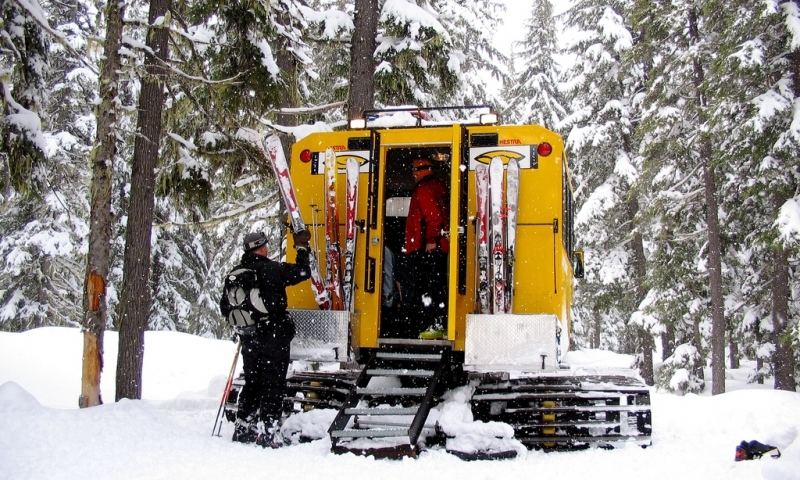 Bailey, this incredible cat ski operation offers guided backcountry snowmobile ski tours.